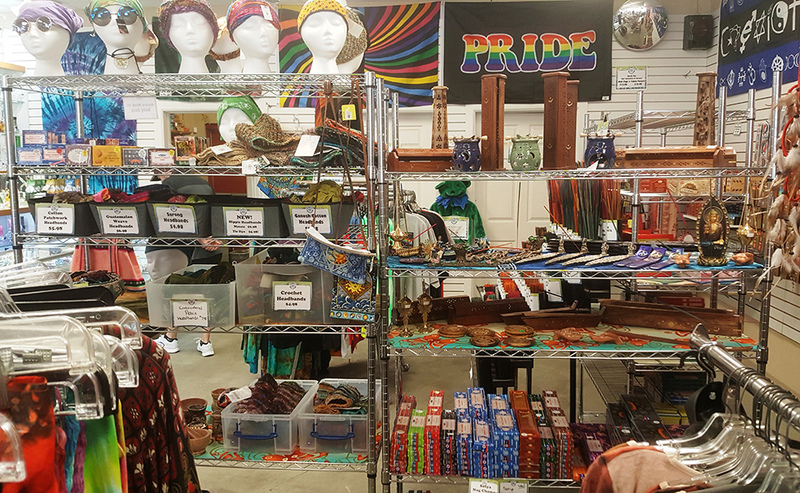 Groovy Goods offers many hippie goods for your home from stones and crystals, incense, sofa covers, tablecloths, and more! Choose these natural creations for their aesthetic beauty, or for the powers many believe they possess. Regardless of the reason, our large collection of tumbled stones, spheres, rock specimens & crystals are sure to please. You won’t find a better selection of high grade tumbled stones at affordable prices in the Des Moines area. 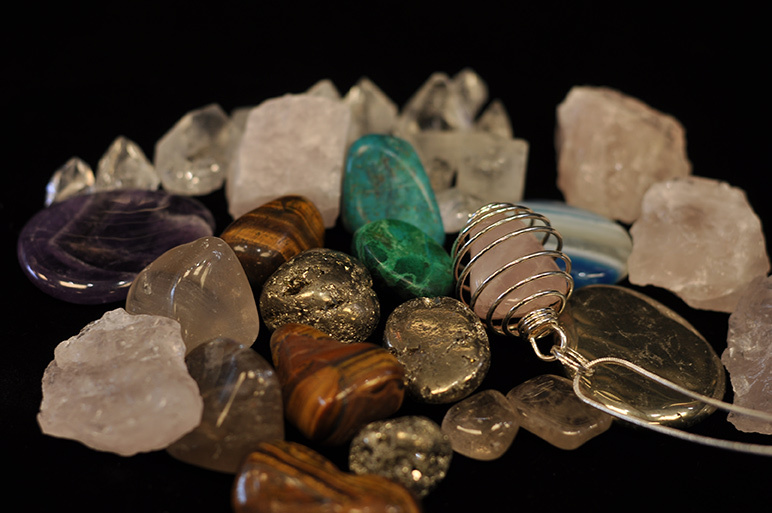 We carry the staples for every stone collection, including Rose Quartz, Obsidian, Hematite, Tiger’s Eye, Jasper, Amethyst, Aventurine, Clear Quartz & Green Aventurine. And we also stock less common stones like Malachite, Moonstone, Citrine, Lapis Lazulite, Labradorite, Black Tourmaline & Rhodonite. Most of our tumbled stones are available in necklaces & bracelets as well. Our Baltic Amber, known to the be the most potent, is sourced directly from Lithuania in the Baltics. Our selection includes rough stones, tumbled stones & necklaces. Teething baby? Try our amber teething necklaces, individually knotted for safety. Moms everywhere swear by them! If you prefer rough stone specimens, we have those, too. Black Tourmaline points, Amethyst & Citrine Geodes, Aragonite & Apophylite points, & Peacock Ore, to name just a few. And many of our stones are also available in polished spheres. 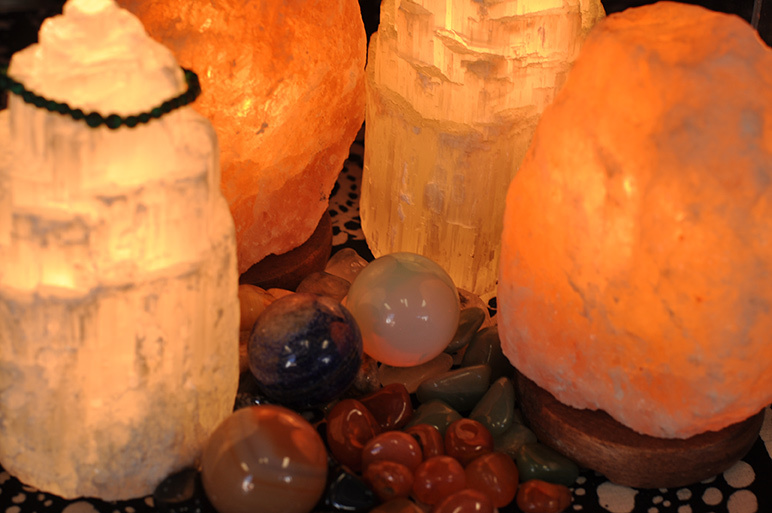 Add soothing light, remove negative ions and achieve energy balance with our lamps made of all natural Selenite or Himalayan Salt. Himalayan Salt lamps are all the rage now, but beware of low quality or fakes. Our lamps are sourced directly from the Asian continent & are of the highest quality. 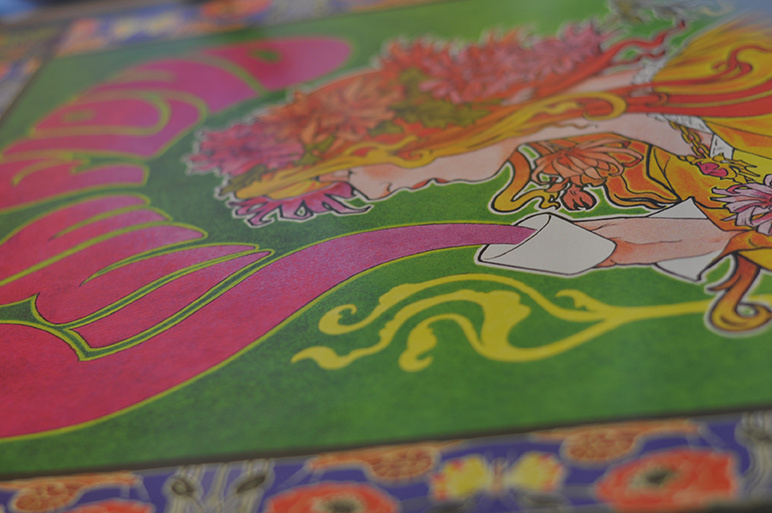 A whiff of Patchouli or Nag Champa can bring back fond memories of the groovy 60s. Lavender has the power to soothe. Citronella keeps the bugs at bay. 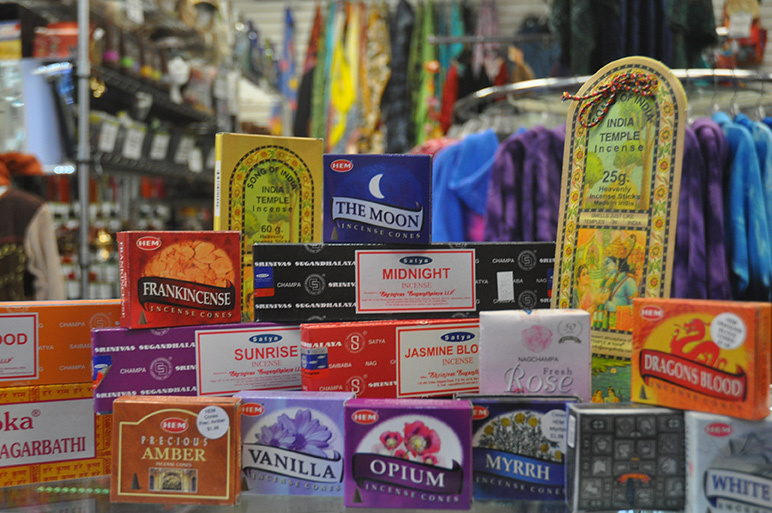 Cinnamon, Opium, Frankincense, Lemongrass & dozens of other fruit or herb-inspired scents & blends in the largest incense selection in central Iowa. Choose from cones, or traditional 11” & long-lasting jumbo 18” sticks. There are packaged varieties from Gonesh, Satya, HEM and India Temple. For those that want to mix ‘n match, our Foxy Lady incense, hand-dipped in Oklahoma, is available by the stick. 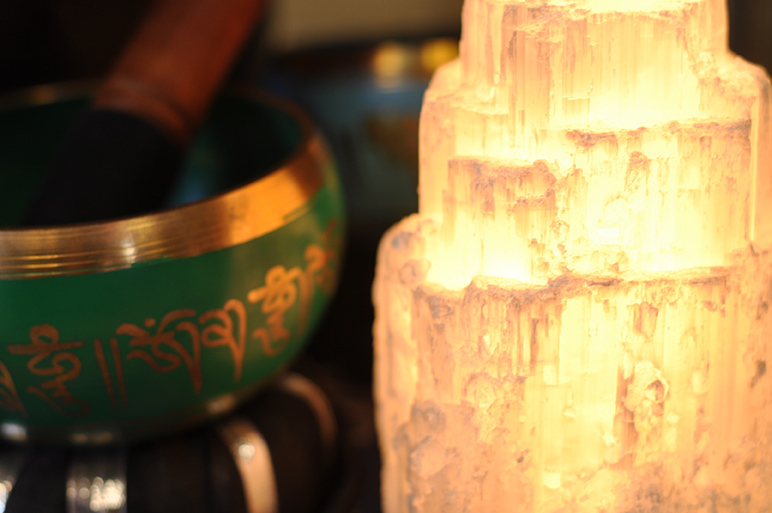 You need to burn your incense in style, and you’ll find yours here! Glass bottle holders keep ashes neat & tidy at the bottom of the bottle. Wood coffin & tower burners have lids for an attractive look when not in use. Flat incense holders, often referred to as “canoe” burners, come in a wide variety of styles & materials, from simple wood to fancy resin in the shape of dragons, fairies & more. There are burners for cones, too, and many of our stick incense holders accommodate cones as well. Our new Backflow Cone Burners will turn heads while adding beauty to a room with their sculptured designs. Special cones, available in mix ‘n match fragrances, along with the specially-designed burner, result in a mesmerizing smoke trail that flows down instead of up, like a fountain. If you want to avoid the smoke & ash all together, we have incense resins & oils, along with the charcoal & tealight burners to enjoy them. 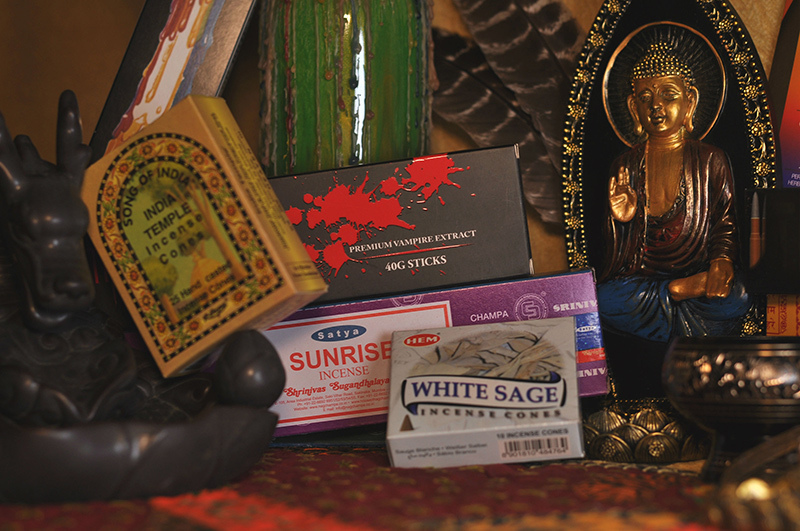 You’ll find all the common scents, including Dragon’s Blood, Patchouli, Amber, Sandalwood, Vanilla & more. 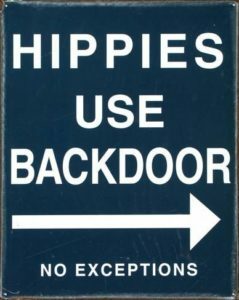 Posters have long been a staple for the hippie home. Choose from music-inspired designs from Bob Marley, The Beatles, Led Zeppelin, Prince, David Bowie, Pink Floyd, the Grateful Dead & more. There are classics like The Dude, Steadman & Alice in Wonderland, as well as funny & artsy designs. The classic paper style are available, as well as fabric versions, and some are even blacklight sensitive. We have the largest selection of tapestries in the Des Moines area. These versatile staples of the hippie home can decorate a wall, but they’re also great as sofa covers, tablecloths, beach blankets & more! Choose from classic India-style mandalas, as well as celtic, fantasy & more in both single and double sizing. We even have round tapestries! 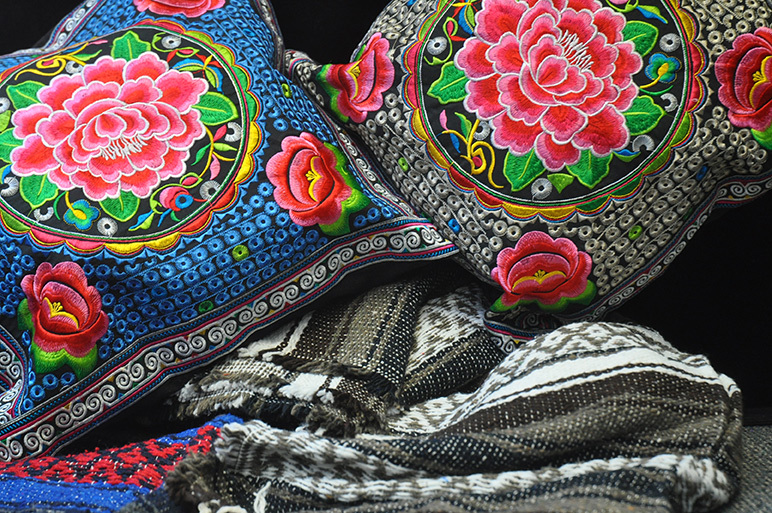 Seasonally available fleece and woven Mexican Baja blankets are perfect to get cozy. 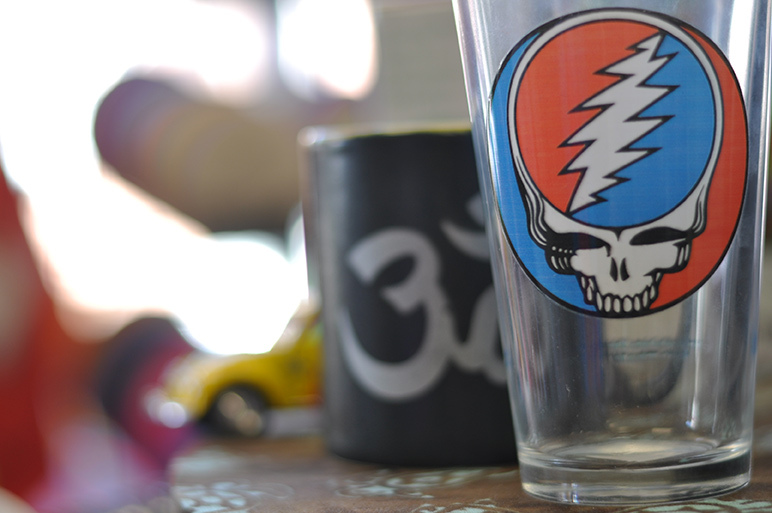 Let your freak flag fly indoors our out with our nice selection of pride, peace & other classic hippie designs, as well as colorful Buddhist prayer flags. Dreamcatchers & figurines make great gifts for your home or someone special.